"Another pair of yellow pants!!" 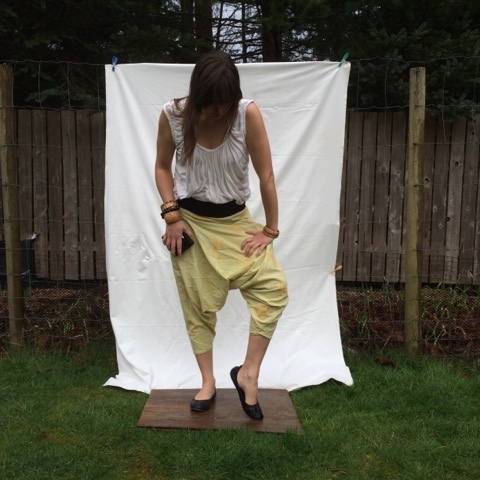 Maybe I am the only one to notice that I've just finished making another pair of yellow pants. But these ones are different, really, cross my heart. Firstly, they are naturally dyed with rosemary. 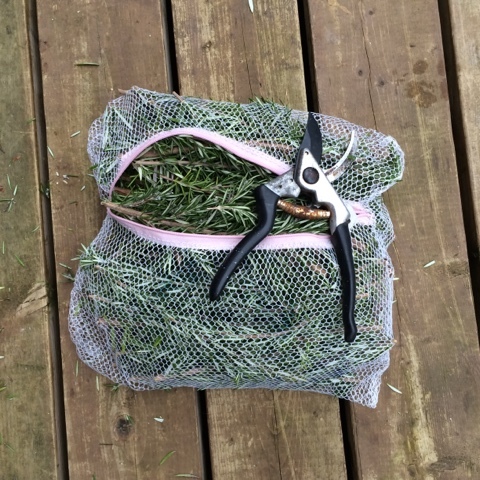 recipe as to how to accomplish this, but, thanks to my talented husband, I have enough rosemary to do multiple experiments with. Among many benefits of this plant, "adding 2 to 3 drops of Rosemary essential oil to burners, vaporizers, diffusers or to your handkerchief can aid in stimulating the functions of the brain, encouraging clarity of thought, enhancing memory power, granting mental awareness and strengthening the central nervous system." It has an interesting and in depth history, across many cultures. I would love to research if rosemary, as a clothing dye, transfers some of its medicinal properties to the wearer through skin contact. Secondly, the pattern for these pants is incredibly simple. By folding a yard of fabric into a "V" and sewing the full width of the fabric back on itself on either side creates the pants. 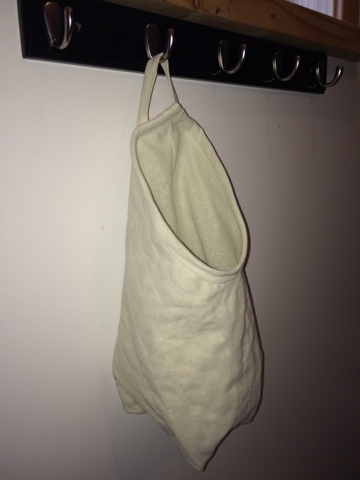 Add a waistband, 30" x 10", in this case and they are done. 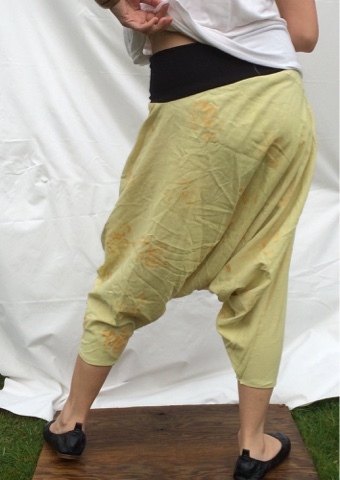 I'm not sure if by adding a wide stretch waistband would make any pants incredibly comfortable, or if the fullness of these harem pants, with the stretch waist, just makes the perfect combination. 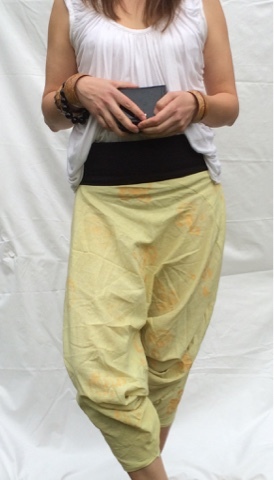 With the right selection of fabric, these pants can be dressed up or worn for yoga. 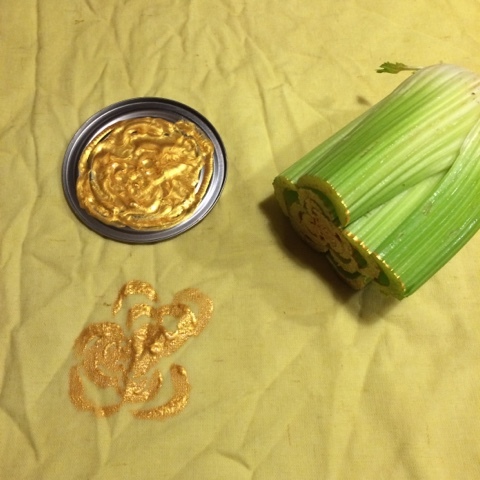 Finally, in order to add more visual interest to the fabric, I used celery to stamp on golden roses.